This semicircular arched top of the chancel arch of St Michael in Amberley is of archetypal Norman Roamanesque design. 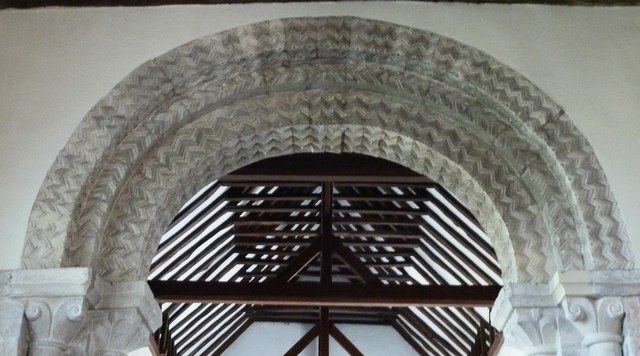 Firstly the arch is purely semicircular (with no hint of the later pointed arches of the Gothic periods) and secondly for the zigzag ornamentation - the commonest design of all in this period of the late C11th to C12th. The church of St Michael and All Angels in Amberley, West Sussex is thought to have been started in the early C12th, with the nave and chancel arch dating to about 1150. The chancel and tower are about 100 years younger (mid C13th). The site was in ecclesiastical ownership as far back as the C7th however, so there was probably a much earlier Saxon church on this site, most probably originally constructed of wood. Nothing of this earlier putative church has been discovered to date however. The current church has some fine Norman features such as the zigzag decoration on the curve of the chancel arch and some round-topped windows in the nave. The triple lancet East Window in the chancel is typical of the Early English phase of Gothic architecture which followed the Romanesque style of the Normans. The three lancets of this window are perhaps quite unusually widely spaced. The roof of the nave is somewhat unusual, sloping from an apex above the nave down in a single sweep to encompass the southern aisle. Within the church is a square, late C12th font, although this was substantially repaired in the Victorian era, and some interesting, if somewhat faded, wall paintings from the C14th. Amberley is a village in the Horsham District of West Sussex. Situated at the foot of the South Downs. The village is noted for its many thatched cottages.One of the attractions in Amberley is Amberley Working Museum. Amberley has its own railway station on the Arun Valley Line, with regular services to Bognor Regis, Portsmouth and London. To the north of the village is the tidal plain of the River Arun, known as Amberley Wild Brooks. This wetland area is a Site of Special Scientific Interest which floods in winter and is known for its wildfowl. Amberley also has a castle, which is now a Hotel, next to which is a Norman Church, the Parish Church of St Michael.